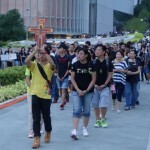 Even though the 2014 Hong Kong Umbrella Movement was mainly a political movement sparked by economic and political distress, religion played a significant factor in the event. The role of religious leaders and symbols has been discussed in different media channels throughout the duration of the protests, for example by the South China Morning Post. Overall, the comments related the prominence of religion in the Movement to contemporary relations between Hong Kong and mainland China. 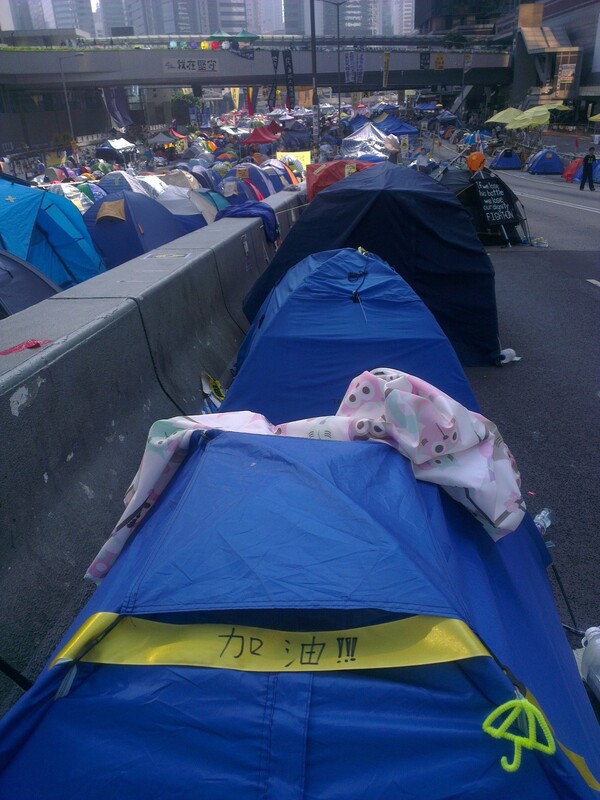 However, the Umbrella Movement, a large and complex social movement, had many underlying motives. What the media sources failed to take into account were religious motives for political engagements or disengagements of individual Hong Kong religious practitioners. I focus on the role of religion during the Umbrella Movement from the viewpoints of these individuals, in this case Buddhist and Christian practitioners. I met these individuals for my PhD research, which I conducted in the Hong Kong region prior to the movement. The narratives of Christian and Buddhist practitioners show that the Hong Kong Umbrella Movement resonates with other social justice movements that have taken place in other countries and at other times. As such, the meaning of the Movement for individual practitioners has spread well beyond the context-specific political relations between Hong Kong and the Chinese mainland. However, this emphasis on current relations between Hong Kong and mainland China only partially explains the presence of Christianity—and absence of Buddhism—during the movement. What is missing in the media reports are narratives of Hong Kong individuals who have decided either to join in or dissociate from the protests, based on motives that are partially or fully related to their religious backgrounds and to their notions of socially engaged religion. Their perspectives challenge the media’s reductive political explanations. In an email sent to me in November 2014, a Protestant practitioner in her early-30s wrote: “I can’t help but think that Jesus himself was defiant to the law. … What he did in the temple was destructing the business eco-system and undermining the self-interest of people who enjoyed status quo in his time. There’s nothing new under the sun.” She ended her lengthy email with a quote by Dante (“the hottest places in Hell are reserved for those who in time of moral crisis preserve their neutrality”), used by Martin Luther King Jr. during his struggle for race equality in the US in the1960s. The young Protestant woman drew parallels between the Hong Kong Umbrella Movement and theologies accompanying Christian movements for social justice performed in the past. She suggested that the Christian struggle for justice started when Jesus challenged the status quo of his time. Throughout history, different social movements have tried to mirror his protest. Examples include liberation theologies in Latin America of the 1960s and 1970s, minjung theology in South Korea in the 1970s, and now in the Hong Kong Umbrella Movement. For the young woman, and my other Christian informants, relating the Umbrella Movement to other social movements that aimed to achieve similar goals gave the Movement more relevance than it may otherwise have achieved. I made a similar observation when communicating with some of my Buddhist informants about the protests, even though they mainly emphasized inaction rather than action. A practitioner in his early forties asked me one day what the Buddha did when his kingdom was overtaken by foreign rulers. He also alluded to stories about the Vietnamese monk Thich Nhat Hahn and the Tibetan Dalai Lama, neither of whom fought when they were expelled from their countries. 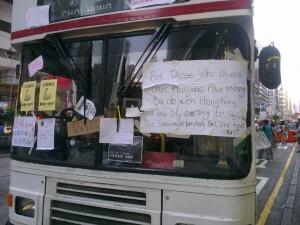 By posing rhetorical questions about these historical happenings, the Buddhist practitioner attempted to place his response to the Umbrella Movement in the broader context of Buddhist teachings towards struggles over social justice, in effect implicitly relating the Umbrella Movement to socially engaged Buddhism. Socially engaged Buddhism is a movement that emerged in different Buddhist countries during the twentieth century, with the intention “to apply the values and teachings of Buddhism to the problems of society in a nonviolent way” (King 2012:5). Among noted Buddhist practitioners of socially engaged Buddhism are Thich Nhat Hanh, the Dalai Lama, Sri Lankan Buddhist leader Ariyaratne, and Taiwanese nunCheng-yen, who founded the Tzu Chi Foundation (Park 2010:29). While socially-engaged Buddhism is not as well-developed in Hong Kong as in other Asian countries, such discourses importantly draw parallels between the Hong Kong Umbrella Movement and similar Buddhist movements in other Asian countries. For my informants who shared their opinions with me before and during the Umbrella Movement, the protests referenced larger religious movements. Not only did they allude to the difficult relations between Hong Kong and mainland China, but also to issues extending far beyond this context-specific relationship. By accounting for the narratives of Hong Kong’s individual residents (rather than basing conclusions solely upon observation), I argue that the relationship between Hong Kong and the Chinese mainland is not always as prominent as is to be expected. Although ostensibly a local movement sparked by context-specific political and economic factors, individual practitioners remind us that the 2014 Umbrella Movement encompasses a wide variety of other, including religious, meanings. They relate the Movement to other socially engaged Christian or Buddhist movements striving for justice. In the aftermath of the 2011 Occupy Wall Street Movement, theologians Joerg Rieger and Kwok Pui-lan argued for the creation of a new theology, ie, a theology of the multitude. They argue that “in the 1960s and 1970s, Latin American liberation theology, feminist theology, black theology, and other liberation theologies emerged … No doubt the world has changed, and movements and ways of analyzing the world are changing as well. But much of what liberation theology has to say is still very relevant” (Rieger and Kwok 2013:4). 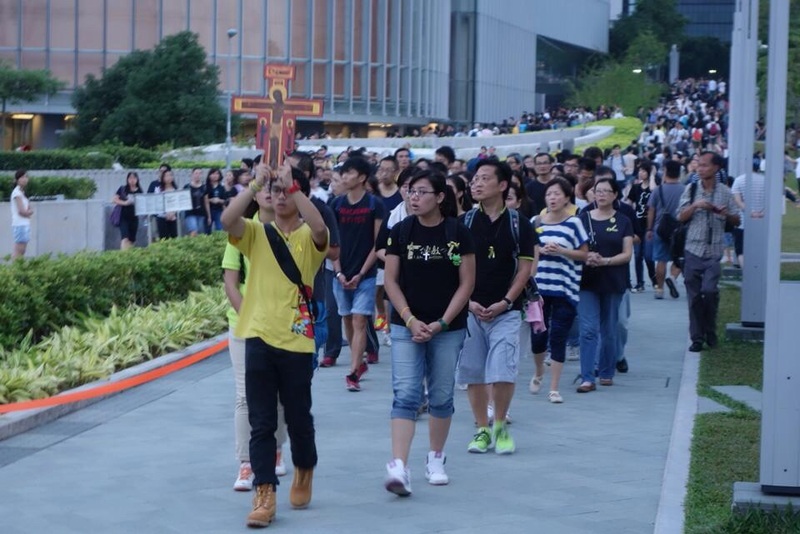 In the aftermath of the Hong Kong Umbrella Movement, one could acknowledge the emergence of a new, socially engaged theology that embraces both Christianity and Buddhism. Considering the role of religion during the Umbrella Movement, Hong Kong residents have experienced the Movement as part of larger struggles for justice, an understanding that to date appears to have eluded media sources. Editors’ note: This article is part of a series on two recent social movements: the Sunflower Movement in Taiwan and the Umbrella Protests in Hong Kong. Mariske Westendorp (PhD candidate in anthropology at Macquarie U, Sydney) is currently researching the intricate relationships between Hong Kong Christian and Buddhist religious institutions/practices/ontologies, and urban Hong Kong’s political and social urban processes. Other research interests include urban anthropology, and the role of religion in development work and projects. Please send news items, contributions and comments to SEAA Contributing Editors Heidi K Lam ([email protected]) or Yi Zhou([email protected]). Alyssa Paredes (AP): What experiences led to your interest in studying convenience stores, or konbini, in Japan? Gavin H Whitelaw (GW): The first of the big convenience store chains began expanding in Tohoku when I was a teacher in rural Yamagata. I became a denizen of Sunkus, FamilyMart and Lawson. They gave me a place to go and get things quickly, minus the intense observation I felt at other local shops. A convenience they offered was this alternative social space. That idea began to gestate. While doing my Master’s degree, I took courses with James Watson, editor of Golden Arches East: McDonald’s in East Asia. McDonald’s is helpful for thinking about globalization. But the convenience store in Japan seemed more engaging and complex given its ties to neighborhood shop culture and focus on an expanding range of day-to-day needs. 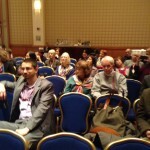 Anthropology offered a way to move beyond a management studies approach to the topic. AP: The convenience store seems to me to be a challenging ethnographic object because interactions can often be so momentary and seemingly unreflexive. How did you negotiate the issue of temporality in your fieldwork? GW: During my pre-dissertation research, I was an active consumer and “inquisitive observer.” But there was more to the store than I could observe from just the aisles. So I decided to put myself in the shoes of the people who work there, an experience that embedded me in a web of relationships involving owners and their families, workers, corporations, customers, and neighborhood groups. Repositioning myself this way grounded me in a particular place. As I worked, the store became more than simply a site to buy food and read magazines. It was a source of livelihood and played a meaningful role in how people negotiated certain demands and positioned themselves. Events—an accident or snowfall, exam season or a local festival—deepened my perspective on certain continuities within a rapidly transforming commercial landscape. AP: You chose to do your “observant participation” at branded, recognizable institutions. But the strange thing about convenience stores is that there is also a kind of anonymity in their ubiquity. How did this play out while you were conducting research, and did any ethical issues come up in your ethnographic writing? GW: You raise a good point. Donning the employee uniform carries a certain set of responsibilities. There were times at the counter when I wanted to chat more with a particular customer, but didn’t because it disrupted the impersonal familiarity critical to the store’s functioning. That experience of “holding back” provided ethnographic grist in my analysis. Clerks observe a great deal and silence may be part of a tacit social agreement. 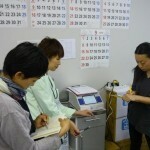 As customers, we also participate in this process. Such insight helps reorient how we approach places like konbini and the roles they serve. AP: In your research, you discuss the konbini as a pioneering model of cultural global retail that “makes local tastes and conditions central to the functioning of the store.” How might the study of convenience stores influence the ways we think about Japan, and globalization in general? GW: The convenience store is useful for exploring theories and questioning assumptions about Japan. It is part and parcel of global capitalism, yet its expansion and impact are hardly uniform. In the United States, it hasn’t transfigured retail and small business to the extent it has in Japan. American convenience stores might sell gas or have a pharmacy counter, but customers rarely interact with actual owners. In Japan, convenience stores calibrate to everyday needs very differently. While some shops may feel anomic with high turnover in people and products, cultural entailments persist. Behind the counter,konbini stubbornly remain family-run operations. America’s main streets are overshadowed by mammoths like Amazon and Wal-Mart, but in Japan, the small corner store is relied on to provide food, daily necessities, and innovative services with a modicum of social interaction. The konbini’s emergence as a commercial hub and vibrant human crossroads (ningen kōsaten) was largely unanticipated. Its expansion, while linked to changes in the family, economic life, and government policy, encourages more careful assessment of how terms like “neoliberalism” and “precarity” are applied to the cultural and social conditions we observe today. The accessibility of my research topic benefits my teaching. Convenience stores are, literally, just around the corner. Students use them and hold opinions about them, but typically haven’t stood behind the counter. Ethnography takes that step. Its power lies in the ability to share something about how other people go about their lives while revealing to us something about ourselves. Approaching the convenience store as a life world rather than a momentary stop turns a familiar global site into a window onto the dynamics of family, work, and market relations in Japan. AP: I’m curious to hear about your next line of research. Could you share with us a preview of your current research project? GW: My konbini research and work on material culture and foodways made me interested in a corollary to consumer convenience: inconvenience. One direction this has taken me is to follow waste, especially food waste, to better understand the political economy of disposal. A second, complementary field project looks at a range of conventions that undergird people’s relationship to the environment, landscape and agriculture. In both projects, I am particularly intrigued with attitudes and practices that persist despite being deemed by some as inefficient, irrational, or unhealthy. Gavin H Whitelaw is a sociocultural anthropologist whose research focuses on globalization, commerce, work, food, and material culture, particularly in contemporary Japan. 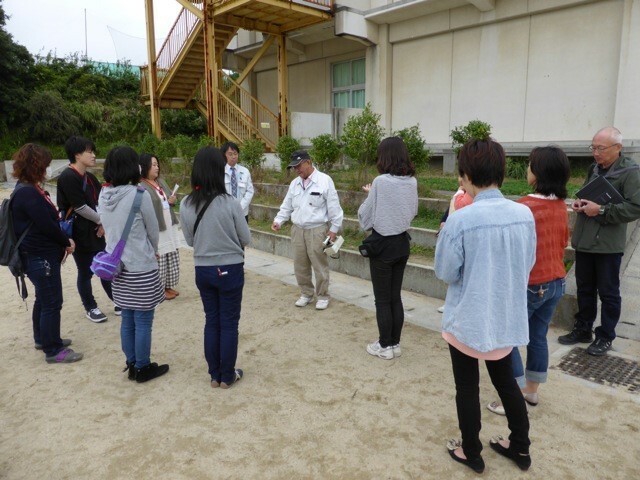 He is associate professor of anthropology at International Christian University and is a visiting scholar Harvard University’s Reischauer Institute of Japanese Studies during the 2014-2015 academic year. Alyssa Paredes is a PhD student in the department of anthropology at Yale University. 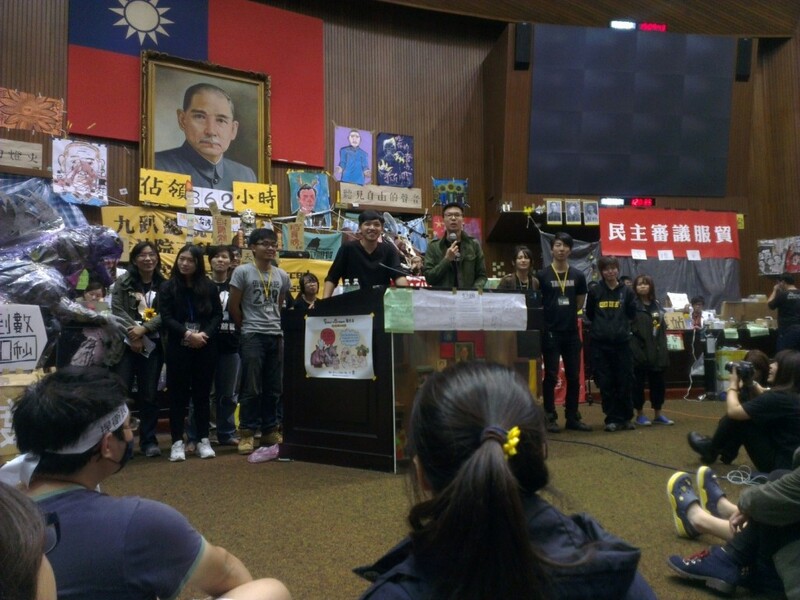 On March 18, 2014, several hundred Taiwanese student and civil activists broke into the Legislative Yuan, the parliament of the contested island nation, launching the Sunflower Movement, a protest against the ruling Chinese Nationalist Party (KMT) and aligned business elites’ alleged collusion with authoritarian China to pass a highly controversial trade deal. It took 24 days of occupation and a rally of half a million people to make the KMT capitulate. A coalition of pro-independence and left-wing activists emerged triumphant. Taiwan’s political fate, and with it, China’s territorial ambitions writ large, suddenly became an open question again, as I recently wrote in the Journal of Asian Studies. Less than half a year later, Hong Kong students entered the walled-off plaza of their own Legislative Council during a demonstration for “genuine universal suffrage,” the right to elect a leader of their own choosing. After 87 rounds of police tear gas failed to disperse the crowds, Hong Kong’s streets swelled with protesters and supporters, and the student movement and the long-planned Occupy Central campaign won world attention as they morphed into the Umbrella Movement, including 79 days of occupation of central government and commercial districts. For a time, it even looked as if we might be witnessing the birth of an “Asian Spring”. 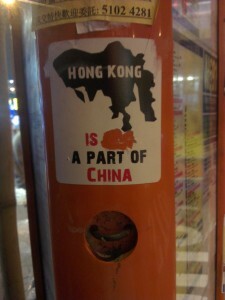 Ultimately, the movement was dispersed before achieving its policy goals, but Hong Kong will never be the same. The Sunflower and Umbrella Movements shared ideals, tactics, foes, and, to a lesser extent, personnel. They both trumpeted democracy, self-determination, rationality, and peace. They both occupied streets, blocked traffic, sustained sophisticated tent cities, and defied attempts at police dispersal and gangster intimidation. 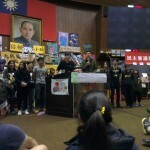 They both targeted not only their local administrations, but those institutions’ complicated ties with the Chinese Communist Party (CCP), as well as the CCP itself.Hong Kong activists also visited Taiwan during and after the Sunflower Movement, and Taiwanese attempted, not always successfully, to enter Hong Kong to support their counterparts. The two movements shared me, too. I was at both, almost from the beginning. In Taiwan, I climbed a ladder into the Legislative Yuan the morning after the initial break-in and then spent most of the next 23 days in or around the building. 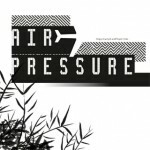 Immediately after the first tear gas shots were fired in Hong Kong, I booked tickets from Taipei and ended up joining the occupation for over one month on two separate trips. While I was not born or raised in these places, and my embodiment disallows me from passing as a “local” despite my linguistic and cultural facility, I have lived, loved, worked and studied in both for years prior to these uprisings. And while concerned friends and family wisely warned me of the many risks of involvement, as an ethnographer with research and personal interests in these movements, participation seemed worth the possibility of being arrested, blacklisted, or worse. How did this positionality affect my research? Not wanting to admit the legitimacy of Hong Kong’s home-grown discontent, the CCP and its media organs systematically portrayed Occupy Central as a US plot to destabilize China. Citing weak personal and financial links to the US National Endowment for Democracy, they claimed that Occupy Central’s academic figurehead, Hong Kong University law professor Benny Tai, and media champion, Apple Daily owner Jimmy Lai, were CIA stooges. Dan Garrett, a former US intelligence analyst and current student at the City University of Hong Kong, suffered surveillance and smear attempts as a purported spy “mastermind”. Knowing that my presence as a US national and recent Fulbright Fellow (partially funded by the US State Department) could likewise be spun by professional propagandists as evidence of US conspiracy, I did take pause before pitching my tent in the heart of the largest encampment at Admiralty. But by then, I had learned from Taiwan Sunflower’s trial by fire that it would be impossible to deeply research this movement without inhabiting and taking part in it, and so I did. This required building trust with activists. From performing intellectual tasks– assisting with translations and communications, connecting international press with local activists, and providing whatever advice I could (when asked), to the more mundane but no less necessary—watching for security threats, distributing food, and cleaning public spaces— I was by no means at an “objective” remove from my field of research. And it would be disingenuous to claim that my affective ties to neighboring occupiers did not color my vision. Such issues of positionality are nothing new to anthropologists who have happily moved past the vacuous, pseudo-scientistic “view from nowhere” claimed by earlier ethnographers. Yet, even as it forced reflexivity, the view from my banner-strewn tent presented other vexing questions. One of my research projects was interviewing mainland Chinese visitors to the Hong Kong occupation sites. Sitting at “home” on Harcourt Road sometimes allowed for easy recruitment with sympathetic passers-by, but occasionally also alienated other informants. It even led on several occasions to heated arguments between hostile mainlanders and local activists on my “porch”. This required me to mix up my location and even my choice of fashion—to choose, for example, whether or not to wear the yellow ribbon of the movement activist—depending on who I intended to interview and what kinds of answers I might expect to elicit. And what answers, if any, were drawn during this research? Although I suggest that the Taiwan Sunflower and Hong Kong Umbrella Movements compose a common struggle, they were planned separately and played out in very different ways. Sunflower sprouted in Taiwan, a politically complex place often poorly understood by non-specialists. It was largely ignored by the global press, but its demands were met, it led to the November 2014 mid-term electoral defeat of the ruling party, and likely redirected Taiwan’s geopolitical future. It also inspired activists in Hong Kong to push harder than they might have otherwise. Hong Kong’s movement, while it has not yet achieved its goal of “genuine universal suffrage,” is not over. A city usually portrayed as apathetic and apolitical has demonstrated a surprising degree of resistance. Umbrella activists continue staging mobile demonstrations across the Special Administrative Region. Tidy narratives of China’s rise under the CCP are punctuated by increasingly loud dissent from within its claimed territory. Even as hundreds of mainland Chinese continue sitting in prison for expressing online support for the Umbrella Movement, the brave mainlanders I interviewed in the occupation continue walking free, circulating images and words from their times in the recent near-revolutionary moment, even if they didn’t always agree with it. And there are many, many more where they came from. 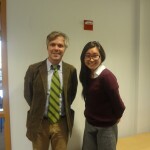 Ian Rowen is PhD candidate in geography at the University of Colorado, Boulder, and visiting fellow at the Taiwan Foundation for Democracy and the Institute of Sociology at Academia Sinica. 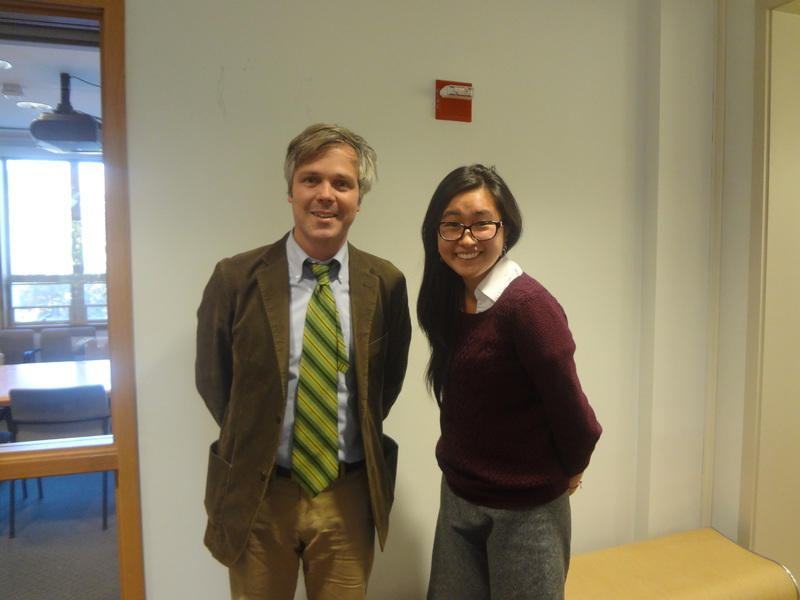 His dissertation research has focused on the political geography of tourism between China, Taiwan and Hong Kong. Editors’ note: The SEAA editors are organizing a series of articles comparing the two recent social movements: the Sunflower Movement in Taiwan and the Umbrella Protest in Hong Kong. Please email Heidi K Lam ([email protected]) and Yi Zhou ([email protected]) to submit suggestions or if you are interested in contributing a paper on this topic. 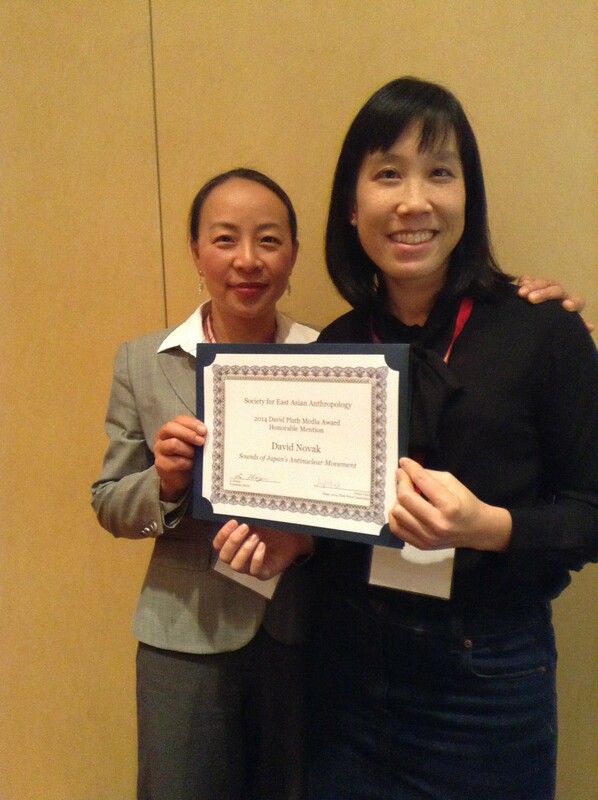 Please send news items, contributions and comments to SEAA Contributing Editors Heidi K. Lam ([email protected]) or Yi Zhou([email protected]). Jennifer Bruno: What inspired you to undertake your research with Japanese Brazilian migrants in Japan? Joshua Hotaka Roth: There was a lot of excitement about globalization and transnationalism when I was in graduate school in the early 1990s. I had befriended several Japanese Brazilians when I was in university in Japan in 1989, just as the large labor migration from Brazil to Japan was beginning, so the project just presented itself to me. By the time I conducted research in 1995, there were about 250,000 Brazilians, mostly of Japanese ancestry, working in Japan. Some of the early globalization literature celebrated flows, the possibility of multiple identifications beyond the taken-for-granted local or national, and the rise of creole cultural forms. But I found that for many Japanese Brazilians, migration to Japan involved a reconfiguration of social relations in an attenuated form. I’m reminded of David Graeber’s reading of enslavement as involving the violent tearing the person, defined as a unique conflux of relations, from that web of relations. Of course migrants have agency while slaves do not, but it would be a mistake to assume freedom of choice when choices are always constrained, and when migrants keenly felt their displacement from established webs of relationships. JB: How has the situation for Japanese Brazilians changed? JHR: The Japanese Brazilian presence in Japan has shifted a lot in the last 20 years. The numbers of Brazilians in Japan peaked at about 311,000 just before the financial crisis in 2008. Today with the Brazilian economy doing better, only about half remain in Japan. In the 1990s, most were on temporary visas that had to be renewed every one or three years. Most worked in temporary factories positions that they really didn’t enjoy. The majority that remain are committed to a long-term residence in Japan, and some see it, much more than in the past, as their permanent home. Japanese Brazilian residents in Japan still face uncertainty, but compared to the past, more have moved into stable employment, started their own businesses, raised children, and established new webs of relationships. JB: Could you talk about the transition from your first project to what you’re doing now? What questions have guided your research? JHR: My current research is on Japanese automobility. I’ve published on the history of driving manners and discourses on emotion and risk. I’ve written about gender and driving, and am looking into a project on minorities and driving. But how did I first get into this? I’m not a car fanatic. I did work on a car assembly line for my first project. But the real link was the conceptual focus on acceptable levels of risk among Japanese and Japanese Brazilians workers that emerged in a chapter on work-related accidents. Subsequently, I wanted to go to Brazil and learn more about the communities from which many of the migrants I met in Japan had come. Among other things, I ended up writing an article on Japanese Brazilian gateball (a form of croquet) in São Paulo. At a time when the fear of crime was widespread among middle and upper middle class Paulistanos, it was curious that middle class Japanese migrants willingly occupied public spaces, rather than retreating behind the numerous fortified apartment blocks and gated communities. Once again, I found myself inadvertently writing about the circumstances that may affect acceptable levels of risk. But the risk literature often makes for pretty dreary reading. I decided on automobility because it involves questions of risk and its governance, but also of desire. Along the way, however, I’ve also become interested in questions involving maps, spatial orientation, and the cultural category of “hōkō onchi” (directionally tone-deaf) and currently am working on an article about getting lost in Tokyo. Joshua Hotaka Roth is Professor of Anthropology at Mount Holyoke College. His publications include Brokered Homeland: Japanese Brazilian Migrants in Japan (Cornell Univ. Press), “Mean Spirited Sport: Japanese Brazilian Croquet in São Paulo’s Public Spaces” (Anthropological Quarterly), and “Heartfelt Driving: Discourses on Manners, Safety, and Emotion,” (Journal of Asian Studies). Please send news items, contributions, and comments to SEAA Contributing Editors Heidi K. Lam ([email protected]) or Yi Zhou ([email protected]). Playing with Nan is the story of a young Nepali man who migrated to work in a Nepali restaurant in northern Japan. The film explores his daily life at work and his family at home, which reflects socio-cultural problems related to globalization. Twenty-eight years ago, Ram was born in a rural village in Nepal. Working on the farm, Ram saw little hope apart from surviving in poor conditions. One day, he decided to escape from the village and poverty. In Kathmandu he worked for 12 years at several restaurants. However, he could not change the family’s situation. He heard a beautiful story from a broker about the work and earning opportunities in Japan. He paid the broker US$20,000 to buy a work visa to enter in Japan. He borrowed the money from his relatives and friends with the commitment of paying them back later with 20% interest. Several dramatic consequences occurred within Ram’s life and his family’s after his migration to Japan. Using a predominantly observational mode, punctuated with interviews and conversations, Playing with Nan tells a powerful story about global migration. The directors’ careful filmmaking and editing unpack the paradoxes and complexities of migrant labor in and between Asian countries. With its attention balanced sensitively between the receiving country (Japan) and the sending country (Nepal), this intimate portrait of lives, ambitions, and relationships sheds light on an aspect of globalization that is less frequently addressed in scholarship and news media. We all strongly agreed that this film would contribute immensely to courses on migration, global flows, and contemporary Japan. “Kiatsu” is a collaboration between anthropologist Rupert Cox and artist Angus Carlyle. 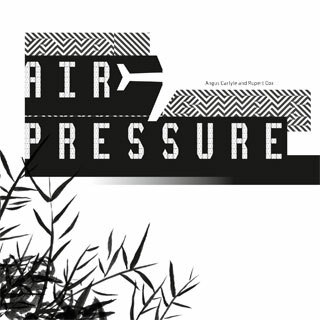 It draws on their experiences of recording the activities of the last farming family living within the concrete and steel infrastructure of Japan’s largest airport, where noise – of taxiing and of take-offs and landings – exerts a constant pressure from before dawn until well after dusk. We are excited to recognize “Kiatsu” for an honorable mention in this year’s David Plath Media Award Competition. This work sets a new, challenging example of the possibilities for collaboration between anthropologists and artists, particularly in its use of sounds and screens for investigating how one family near Narita airport in Japan negotiates the infrastructures of modernization. We encourage everyone to also explore their blog, where Cox and Carlyle detail their production process. Since the nuclear accident at Fukushima Daiichi on March 11, 2011, Japan has exploded with an unprecedented series of spectacular public protests, with crowds of up to 200,000 citizens gathering in front of government buildings in Tokyo to beat on drums, play instruments, and chant slogans opposing the restart of nuclear plants across the nation. 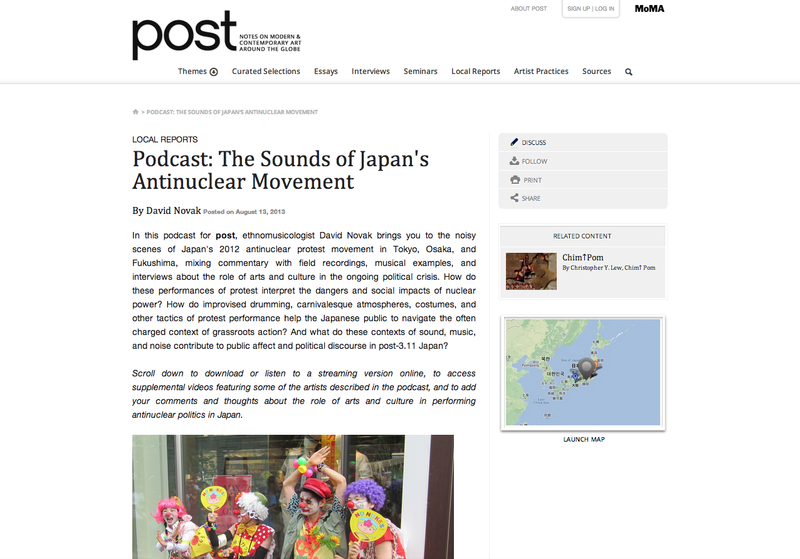 In the context of a near blackout of mainstream media coverage, the combination of social media, musical performance, and street protest took on increasing importance in generating public dialogue about the risks of radiation and articulating fears about the consequences of Japan’s energy policy. This is a very detailed and well-told story of musical responses to the 3-11 triple disaster. The podcast and website are accessible to general audiences, with an impressive amount of information packed into a 15 minute podcast. The website is a very useful feature and models the possibilities of future media scholarship that combines videos, podcasts, texts, and visual images. We all would have liked to see even more materials linked online, given the potential of this platform for collecting, curating, and sharing resources. Heidi Lam (HL): You’ve been making the rounds of the internet lately as the anthropologist who was told that Hello Kitty is not a cat. How does that feel? Christine Yano (CY): I framed the book Pink Globalization in terms of headlines, because I’m talking about celebrity and iconicity through material and commercial culture. And then I became a part of it. I was terribly amused, somewhat horrified….It was a study about being in the crossfire of media. The news broke on a Wednesday and it became the #1 trending item on the internet. I was getting about five media requests an hour….When you’re thrust into the limelight, you realize how you’ll get positive and negative [feedback]. But the whole point, from the point of view of Sanrio or the Japanese American National Museum where the exhibit is happening, is that it’s good. This is a story about buzz. I think anthropology should talk to the public. HL: When writing about globalization, how do you define a field site? CY: I would never propose this book as a dissertation project. I felt okay about it, because I did it over a long period of time. It gave me a historical perspective of 10+ years, [including one] of Hello Kitty outside of “Cool Japan.” This may not pass NSF methodology, but all I could do was to field a whole variety of people in as many places as possible. I didn’t publish every single interview, but wanted to be sure that I had at least one interview from each example of fandom. In the book, I spelled out my limitations, because it wasn’t humanly possible to go around the world and speak especially a variety of Asian languages. The big hole [in my book] is not covering Asia sufficiently. I would love for a consortium of researchers to cover Korea, Taiwan, and other countries in Asia, including Southeast Asia. If I were only researching Hello Kitty in Hawaii or in San Francisco, it’s not book-worthy in terms of what kind of story I can tell. I can’t extrapolate enough of a story from such a small [project]. I’m involved in a new project that might be more dissertation-like—about the ukulele in Japan. I’m not trying to do ukulele in the world, which is probably a book that would sell better because it should be written. But for an anthropologist, life is too short. I would love to have sites all around the world in which I spend six months and try to understand ukulele culture in each. HL: I’ve noticed that Pink Globalization uses a lot of voices. You have big sections of interviews where people speak for themselves. CY: I really wanted that. HL: That’s juxtaposed with text from Sanrio’s website, such as the philosophy statement. How did your fieldwork experience influence your writing style? CY: I almost thought at times the book sounded too pop, too frivolous. But I wanted to match the topic and wrote it to channel a commercial and accessible voice. I was doing that deliberately and wouldn’t have done that in earlier works. I thought I would be criticized for that and to my surprise, I wasn’t. Instead, at least some people have said, it’s very readable and accessible….It’s reflective of the pop world from which Sanrio exists, including her fans. HL: You’ve written about enka, the Cherry Blossom Festival Queen Pageant in Hawaii, Pan American World Airways’ Asian-American flight attendants, and a lot more. What’s the spark? CY: After my initial fieldwork, what I thought I would do is not what I ended up doing. After doing enka, my career plan was to go from enka to gunka to shoka, to different song genres. I did a whole bunch of research on gunka. I abandoned that project and felt I was not the one to do it. I was hired at the University of Hawaii, which put me in a situation where I could develop projects there. This allowed me to do research on the weekends. I didn’t have to wait for a grant to go to Japan. “Doing fieldwork at home” became the basis for these research projects. I had grown up there, so I already knew what things were of interest to me. Oftentimes, they were related in some way to my family. In each case, there was an incident that sparked my interest. For the Pan-American World Airways, there was an ad in the newspaper saying the flight attendants were celebrating their 50th anniversary and that there would be a luncheon. I called the number and got in touch with them. If I had continued with the gunka project, maybe I would have written a book on it by now, but may not, because the topic might have worn me down. HL: This is good to know. We always read the final product and it seems like everybody follows projects to the end. CY: We should have a panel discussion with professors about the projects that they have abandoned and why they have abandoned them….It would teach students about listening to themselves and the project, to see if this is still a good fit. 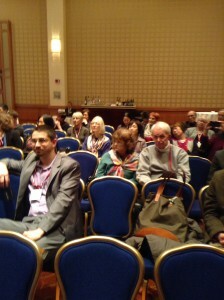 HL: Do you have any words of wisdom for graduate students in anthropology, including those who work in Asia? CY: I wish that Asian Studies and Asian-American Studies had more conversations. There’re real differences between the two, but also some commonalities. For anthropology in general, I think getting away from the ivory tower and moving towards embracing what might be called applied anthropology. I’m hoping that current graduate students don’t see that necessarily as “the thing that I had to do because I couldn’t get a real job.” Anthropology can only be strengthened by making ourselves and the work we do accessible to the general public. The point is about creating bridges, rather than putting up walls. We have a lot to contribute to the present and the future, and it shouldn’t always exist in our educational institutions. 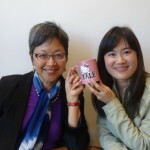 Christine Yano is visiting professor of anthropology at Harvard University (2014-15) and professor of anthropology at University of Hawai’i at Manoa. 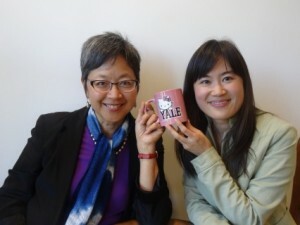 Her latest book is Pink Globalization: Hello Kitty and Its Trek Across the Pacific (Duke 2013). 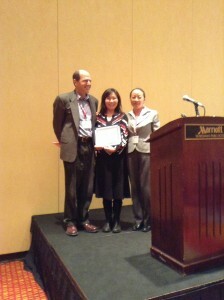 Heidi Lam is a PhD student in the department of anthropology at Yale University. Please send news items, contributions, and comments to SEAA Contributing Editors Heidi K Lam ([email protected]) or Yi Zhou ([email protected]).